The evolution of the Alpinist Pro, the Alpinist Tech features the aggressive functionality of a mono-point with a precisely positioned secondary point for extra support and stability. Designed for technical climbing at the highest level, the Alpinist Tech is also our lightest technical ice crampon making it a great choice for top level alpinism where the secondary point provides extra stability on hard snow and mixed terrain. The walking points also feature special auxiliary points that provide extra stability on funky ice petals and cauliflowers. Using much of the same technology and innovative design as the Blade Runner crampons, the Alpinist Tech ensures a precise fit on modern boots and extra rigidity in the connection between the heel and toe platforms. This is due to the unique heel slide that integrates the micro-adjustable linking bar with the heel piece for better torsional rigidity. Constructed entirely from chromoly steel for the best energy absorption anywhere the crampons might be stressed. The elimination of the connection joints leaves little room for play and reduces much of the flex that can make crampons seem less secure on technical terrain. 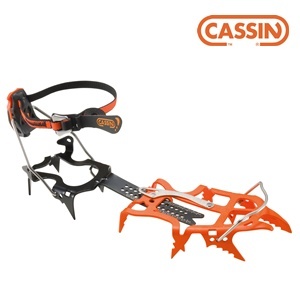 The Alpinist Tech is delivered standard with automatic toe and heel bails, but can convert to semi-auto with the Semi-Auto Toe Bails and Semi-Auto Heel Bails sold separately. The micro-adjustable linking bar allows for fine-tuning of the length. The front bail can be set in three positions for optimally positioning the front points and the heel bail can be set in two positions for different size heel lasts. The heel bail also has three height settings for the most secure attachment to the boot. Dynamic anti-balling plates use a unique design and elastic material to prevent snow build-up underfoot.